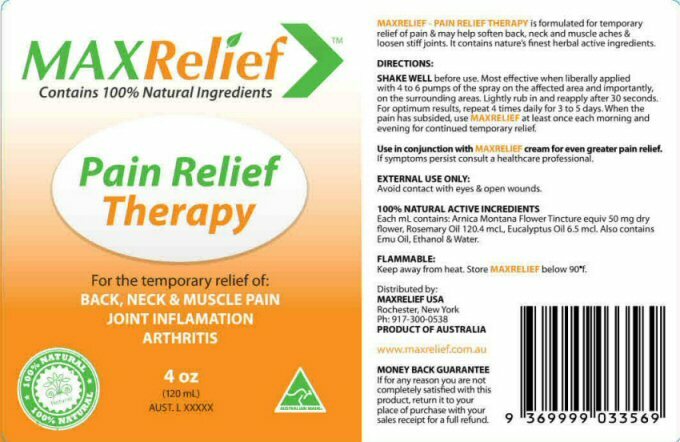 MAXRELIEF PAIN RELIEF THERAPY is formulated for temporary relief of pain and may help soften back, neck, and muscle aches and loosen stiff joints. It contains nature's finest herbal active ingredients. EXTERNAL USE ONLY: Avoid contact with eyes and open wounds. SHAKE WELL before using. Most effective when liberally applied with 4 to 6 pumps of the spray on the affected area and importantly, on the surrounding area. Lightly rub in and reapply after 30 seconds. For optimum results, repeat 4 times daily for 3 to 5 days. When the pain has subsided, use MAXRELIEF at least once each morning and evening for continued temporary relief. Use in conjunction with MAXRELIEF cream for even greater pain relief. If symptoms persist consult a healthcare professional. Also contains Emu Oil, Ethanol and Water. If for any reason you are not completely satisfied with this product, return it to your place of purchase with your sales receipt for a full refund.